Product prices and availability are accurate as of 2019-04-17 22:34:12 CDT and are subject to change. Any price and availability information displayed on http://www.amazon.com/ at the time of purchase will apply to the purchase of this product. 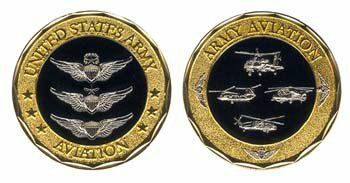 This U.S. Army Aviation Challenge Coin polished bronze with a diamond wave cut edge. Measuring 1 5/8" diameter each challenge coin has the look and feel of quality. Our Challenge Coins are proudly produced, under strict standards, by the nation's leading manufacturer of military products. Each challenge coin would make a great addition to your collection or a wonderful gift.